A beta version of the latest update for LOTRO is currently available on the Bullroarer test server this weekend. Update 22 (Build #1) or Strongholds of the North, features Northern Mirkwood or Eryn Lasgalen as it known since the fall of Sauron and the destruction of Dol Guldur, as well as the Dale-lands. The area includes such iconic locations as The Halls of the Elven King, Lake Town, Dale and Erebor. As this is an early build, players cannot continue the epic story The Black Book of Mordor. At present, the map for the zone is simply a placeholder and serves little navigational purpose. At times the player marker vanishes from the map entirely. However, as Bullroarer is a test server, players can collect a free stipend of Mithril Coins from the Eyes and Guard Tavern and thus use swift travel to all five new stable locations. Bearing this all-in mind, I spent a few hours this afternoon exploring the new area. I have not finished the Mordor expansion yet (mainly because I didn’t enjoy the area) so was careful when travelling around as my primary alt is still only level 109. Porting directly from the Eyes and Guard Tavern takes you to Felegoth, the Halls of the Wood Elves. 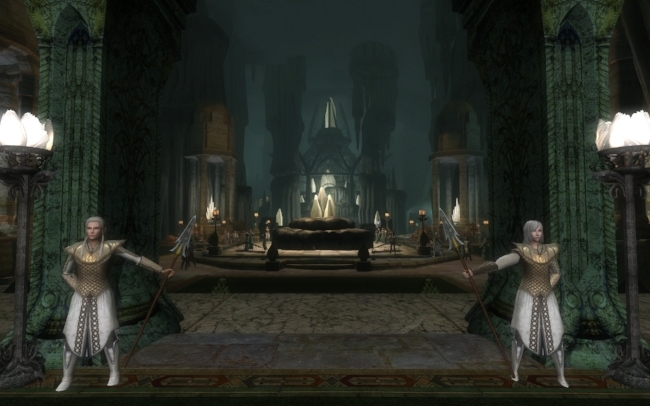 As you would expect, the traditional Elven motif has been maintained in the art design, although there are subtle differences to other Elven enclaves. Because the Halls are mainly underground, the cavernous expanses are filled with stalagmites and stalactites. Yet unlike Dwarven delves, this area is brightly illuminated and has gardens and areas of natural beauty. The keen explorer will also find the dungeon cells where Thorin and his companions were held. There’s also a cellar with a substantial trap door and numerous barrels. One in particular is worth investigating. Northern Mirkwood itself is a dark and dismal place, similar to its existing Southern counterpart. The light soon vanishes once you travel beyond the Elven King’s territory and the path twists and turns. Luckily, they’re wooden posts marking the trail, but it is important to stay vigilant or you can get lost. Places of interest in the immediate area include an encounter with Radagast and the Elven trading post of Loeglond on the edge of Long Lake. Upon exiting Eyn Ladgalen you enter Dale-land and discover a newly rebuilt and thriving Lake-town. This is very well realised and certainly captures the spirit of Tolkien’s original description from The Hobbit. If you travel downstream you come to the ruins of the old Lake-town and the remains of Smaug. It is a nice embellishment, similar to the remains of the Bridge of Khazad-dûm in the Foundations of Stone. North of Lake-town the road leads to Dale which is a broader iteration of what already exists in LOTRO in the instance The Bells of Dale. I like the way the town straddle the tributaries of Long Lake and that water and fountains are a major feature of the design and architecture. Beyond Dale to the Northwest lies the guard post of Ravenhill. Within the small Dwarven edifice is Dís, mother of Fíli and Kíli. There is an entrance behind here, which for the present remains closed and suitably enigmatic. But the jewel in the crown in Erebor. It is large, impressive and gloriously Dwarven. Unlike other Dwarven hubs in Middle-earth, this one is quite linear in its layout and easy to navigate. You can also climb to the western spur of Erebor and survey the land below on the other side, although invisible walls hem you in at present. I always like to explore I LOTRO and make it my business to investigate an area or region as thoroughly as I can. I like to follow the mountain ranges and other topographical features that Standing Stone Games use to funnel players from quest hub to quest hub. What seems to have become a habit in recent years, is that the areas in free updates are often expansive, but not necessarily functional. I got this impression again in parts of Northern Mirkwood and Dale-Land. However, this does not in any way mitigate the time and effort SSG has put into the design of this area. I also found three entrances/exists to the area. One to the South West that may lead to Southern Mirkwood. Another to the North East that may lead to the Iron Hills. I also discovered the Forest Gate which leads from Carrock. All of these “doorways” are currently blocked. Hopefully the next test build will have a more detailed map and will allow for a more accurate appraisal of the area. In the meantime, as ever, I like what I see and it’s reassuring to see the SSG are still maintaining their high standard of world building.